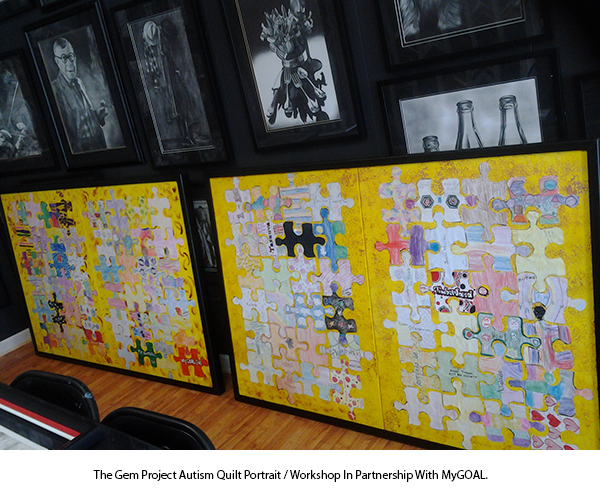 The Gem Project Autism Quilt program partnered with MyGOAL not-for-profit organization earlier this year. MyGOAL is a not-for-profit organization that provides support groups, grants, educational seminars, and empowerment activities for families and individuals affected by or are on the autism spectrum. This Saturday, a few Gem Project members will be attending the 4th Annual MyGOAL Autism Gala. It will take place at the Palace at Somerset Park from 7 PM – 11 PM. The Palace is located at: 333 Davidson Ave. Somerset, New Jersey. The event takes place in The Great Gatsby Room. We will debut a collaborative autism quilt portrait with MyGOAL, while announcing our partnership formally. Tickets are $75 each. Proceeds will benefit MyGOAL’s mission and net proceeds will go toward our collaborative Autism Quilt Portrait program. If interested in purchasing tickets, please e-mail us first: project@thegemproject.org. The theme of the event is called, “Celebrating The Arts In Autism.” Those of you who expressed interest in attending, please e-mail your number as spots are limited now. Thanks to the funding provided by Events Cherished, we were able to frame the original quilt and create a second one, celebrating our partnership with MyGOAL. We’re grateful for our friends Jerry and Karen of PencilWorks Studio, who framed our autism quilt pieces! Jerry also donated a special art work, which will debut on Saturday, for a silent auction for the event. For further information on this grand event visit http://mygoalautism.org or e-mail: info@mygoalautism.org. For tickets, please e-mail us ASAP at project@thegemproject.org. 120 pp are expected, limited spots are only reserved now for ticket purchases.